I love my neighbor's wildflower bed. Don't know what these little blue flowers are but I want some! My cousin recently chose Snow Falling on Cedars by David Guterson for our online family book group. Although this best-selling book published a decade ago was very popular and won a couple of awards, I had never read it (though I did see the movie adaptation years ago). This descriptive, immersive courtroom drama set on a small island north of Puget Sound in the 1950’s has elements of suspense, family drama, and historical fiction. As the novel opens in 1954, a Japanese-American man named Kabuo Miyamoto is on trial on the small island of San Piedro off the coast of Washington. Kabuo is accused of murdering another local man, Carl Heine, who, like Kabuo, made his living as a fisherman. In that first chapter, the courtroom scene is described in detail, introducing some of the people in the town, as well as the island itself. Throughout the novel, courtroom scenes in 1954 are interspersed with flashbacks to fill in the backgrounds and histories of the characters. Kabuo grew up on the island, working side by side with the rest of his family in the strawberry fields. His father’s dream was to purchase a small plot of land for his own strawberry farm. Kabuo’s wife, Hatsue, is sitting near him in the courtroom and also grew up in a family of strawberry farmers with four sisters. Also in the courtroom is Ishmael Chambers, the island’s reporter, editor, and publisher of its small newspaper, taking notes on the proceedings. Ishmael lost an arm in the war. Right from those opening scenes, it is clear that Ishmael is upset by what is happening and there is more going on than meets the eye. From there, the novel follows the court case closely, with dialogue from each witness, so that the reader learns of the details of the case right along with the jurors. Along the way, the author delves more deeply into each character: Art Moran, the sheriff; Lew Fielding, the judge; both the prosecuting and defense attorneys, Carl Heine and his family; and more. Ishmael, Kabuo, and Hatsue – who all went to school together on the island – get the most attention, going back to their childhoods, their parents, and their experiences during the war. I won’t say much more about the plot because the novel very slowly reveals its secrets as the court case unfolds and feeling that gentle suspense build is one of its charms. This is much more than a murder mystery, though. Given the timing of the story and the Japanese-Americans at its heart, history is also a very important component. We see how Kabuo’s and Hatsue’s families (and all the rest of the Japanese-Americans on the island) were a part of the community and then abruptly ripped away to be sent to internment camps on the mainland. We hear the details of Ishmael’s, Kabuo’s, and Carl’s war experiences and witness how those experiences affected and changed each of them. The historical details are an integral part of the story, forming significant parts of each character’s backstory. The effects of war are powerful and tragic, though different for each character that experienced it. Most of all, though, the internment itself and its effects on all the citizens of San Piedro – both white and those of Japanese ancestry – are chilling. The panic and suspicion that quickly spreads after Pearl Harbor and the deep, lingering biases and resentments that are still there almost 10 years later feel frighteningly similar to some of what we are seeing today in our own world. Finally, the setting adds another dimension to this unique story. The island and its inhabitants are described in great detail so that the island itself comes to life, almost like another character in the book. 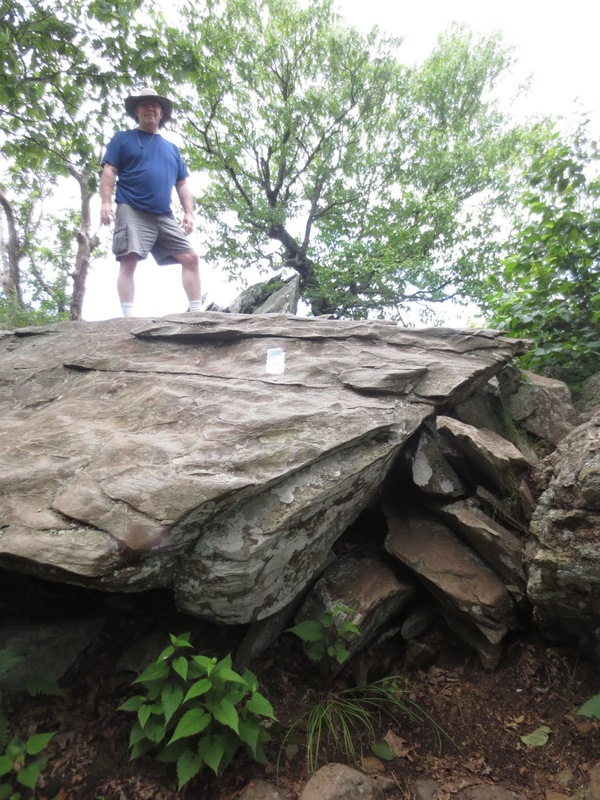 Weather is a significant part of that setting, as well, given the island’s location and size. The huge snowstorm that starts on the first day of the trial adds drama to the proceedings, while weather also plays a significant role in the farming and fishing industries on the island and the everyday lives of the islanders. Snow Falling on Cedars is a long book and a densely written one, filled with descriptions of the island and its people that bring this world to life on the pages. It is beautifully written in a way that makes you care about the characters as if they were real people. The suspense builds slowly, with the exact explanation of what happened the night of Carl’s death held back until the very end. This is a haunting story that I suspect will stay with me for a long time. Although it was first published in 1995, it feels vividly real – and frighteningly relevant – today. Last year, I was blown away by Gordon Kormon’s middle-grade novel Masterminds. 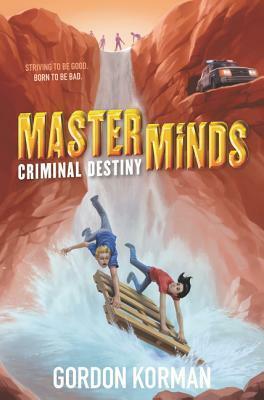 I just listened to the audiobook of the sequel, Masterminds: Criminal Destiny, and it is just as good as the first book, with a unique sci fi plot and nonstop action and adventure. The trick will be to describe it without any spoilers! (don’t worry - I will) First, if you haven’t yet read Masterminds, go back and read my review of that first novel in the series. There is a big plot twist in the first book, so I will avoid giving that away. First a little background on the series. Eli and his friends are thirteen years old and live in a very unique place. Serenity, New Mexico, is a town of only 185 residents and is 80 miles from the nearest town. Most amazing, Serenity has no crime, no violence, no unemployment, and no poverty. It is the perfect town, and the kids have been told their whole lives how fortunate they are to live there. The thirty kids in Serenity have grown up together and all know each other well. Eli goes to school with Amber and Tori who are best friends. Amber is a classic over-achiever, with to-do lists that detail every single day. Tori likes art and is quite talented. Malik also goes to school with them. He’s a bit of a renegade, a rule-breaker, which is highly unusual in Serenity and highly discouraged. Malik often hangs out with Hector, a smallish, nice guy in their class. Eli’s best friend is Randy, a fun guy who often encourages Eli to push against their limits, like figuring out how to unlock hidden features with weapons and car crashes in their very tame, non-violent video games. The kids’ idyllic life begins to come apart, though, when Randy is sent away abruptly to live with grandparents no one knew he had. Around the same time, Amber finds a USA Today newspaper left by some workers from outside the town and reads about things like murder that she has never even heard of before. Little by little, the group of kids begins to suspect that something is not right with Serenity. In the first book, they figure out what is going on behind the scenes of this perfect-seeming community and manage to escape from town, no small feat. In the second book, the kids are on their own, out in the real world for the first time in their lives. They know the secret of who they are and why they are special, but they want to know more. Scary security people from Serenity are after them, as well as their parents, but the kids are determined to find some answers. They quickly discover that life in the real world is full of dangers they never knew existed, and they race across Colorado and Wyoming as fugitives. Even more so than the first book, the sequel is filled with nail-biting suspense and nonstop action, in addition to the mysteries of Serenity and the “special” kids. This story is a thrilling rollercoaster ride, based on a unique premise, filled with unexpected twists and turns. Both girls and boys will enjoy following the adventures of this group of kids and discovering their secrets alongside them. I was riveted by the first book on audio and devoured book two in record time as well! 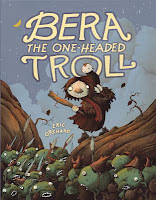 Like the first book, this one was narrated by all of the kids, in alternating chapters, with different voice actors for each kid on the audio. I can’t wait to see what Kormon has in store for these kids in the next installment! NOTE: There are samples of the audiobooks at the Amazon links below. If you have not yet read book 1, then DON'T listen to the sample audio for book 2, Masterminds: Criminal Destiny! The very first line is a huge spoiler for book 1. If you are new to the series, check out the audio sample for book 1, Masterminds (the first link) instead. My husband and I started watching NBC's show Aquarius last year when it first came out and were hooked. This summer, we have been enjoying season 2, as well. Aquarius is set in 1960's L.A. during the time when Charles Manson was becoming popular and growing his following. David Duchovny (of X-Files and Californication fame) stars as Detective Sam Hodiak, an L.A. homicide detective who is old-school and plays loose with the rules. One of his co-workers is Brian Shafe, played by Grey Damon, a long-haired cop of the younger generation who is working undercover on a drug case. Claire Holt plays Charmaine Tully, the first female police officer in the precinct, a pretty, young, blonde woman whom no one takes seriously. Hodiak, despite his gruff exterior, sees the potential in both of the young officers, though. Meanwhile, a 16-year old girl named Emma, played by Emma Dumont, runs away from home and from her parents' constant fighting. She meets a group of other girls her age who bring her to their home. It's basically a hippie commune overseen by a charismatic guy named Charlie Manson. Charlie takes an instant liking to Emma and nicknames her Cherry, and she joins their happy family. Emma's mother is an old friend (and former girlfriend) of Sam Hodiak's, so she goes to Sam for help in finding their daughter. Her husband has political aspirations, so she wants to keep things out of the news but hopes that Sam will agree to look for their daughter. And that's how Hodiak and Manson first cross paths. Soon Shafe - and later, Charmaine - are going undercover with Manson's group, and trying to find out exactly what is going on at his house. Of course, no one knows at this point just how dangerous Charlie will turn out to be, but they are looking into the drugs and all the runaways he attracts. The show alternates back and forth between the police officers' work and personal life and what is happening at the Manson house. It's a slow boil. Hodiak is assigned all sorts of cases to work, while he's keeping an eye on Charlie on the side. Manson's followers are growing in number. All of this is set against a perfect 1960's backdrop of fashions, hairstyles, cars, and the civic unrest building in the community over the Vietnam War and race issues. We have really been enjoying this show, now in the middle of its second season. It's a police drama, in part, but based on a well-known, mystical historical figure at its center. It pulls much of its material from actual history, with the rise of the Blank Panthers, the assassination of Bobby Kennedy, the growing threat of race riots, and of course, Manson's slow but steady growth and descent into madness. In addition, the main characters' personal lives come into the story, as well. It's an engrossing, fascinating story with excellent writing and acting. 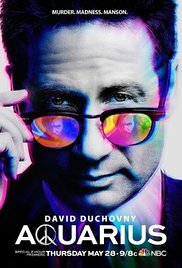 Duchovny is especially good in the lead role, as is Gethin Anthony as the scarily charismatic but crazy Manson. The show is currently in the middle of its second season. Both seasons are available on Amazon Prime for $1.99 an episode or $21.99 a season. The first season is available on Netflix for subscribers. Cable On Demand and the NBC website currently have episodes 4 through 7 of the second season (on ours, episode 4 will be coming off on 7/28). It looks like the second half of season 2 will be starting up on July 28. Whew - super hot, busy week! Working hard to help my youngest son get ready for college - we started dorm shopping last week. It's great to see him so excited! Oldest son came home from college and was sick all weekend - yet another bout of bronchitis thanks to his immune disorder. And Saturday was my 51st birthday! We went out to dinner Friday night with all of us, plus my father-in-law and then enjoyed a fun, lazy day at home Saturday (my son and his girlfriend made crepes for breakfast! ), piles of lovely and creative gifts, and a graduation party for good friends Saturday night. It was a very good birthday weekend for me, and I loved having all of us together (a rarity these day) but was sorry it was due to my oldest being so sick. He just left for class and his apartment. Hopefully, the antibiotics are doing their thing, and he will feel better soon. I finished reading Snow Falling On Cedars by David Guterson for my online family book group. I had never read this award-winning novel before, though I saw the movie adaptation years ago. It's a very descriptive novel about a Japanese-American man accused of murder in the years after the Japanese Internment and the events leading up to that time. It takes place on an island off the coast of Washington, and the setting is vividly described, almost like another character in the story. I enjoyed it, but it is a dense book that took longer to finish than I expected. The prejudices against the Japanese-Americans in the 40's and 50's felt eerily parallel to what we see happening with Muslim-Americans today - blaming an entire class of people for the crimes of a few. Scary. I am now reading a review book for Publishers Weekly, Isra Isle by Nava Semel. It's (in part) an alternative history, based on a historical fact. In 1825, a Jewish man named Mordecai Noah bought Grand Island, NY (a bit of land just south of Niagara Falls) from the Native Americans. He wanted to start a Jewish state...but no one came, and his plan fizzled out. This novel imagines what would have happened if it had worked, and Jews had had a safe haven way back then. It's interesting so far, though a bit confusing at times. I grew up in Rochester, NY, and often visited Grand Island - its real-life history includes an amusement park called Fantasy Island! - so it's especially intriguing to me. I finished listening to The Secret Language of Sisters by Luanne Rice, a teen/YA novel about one of two sisters who is paralyzed in a car crash and has locked-in syndrome. It was very good and engrossing. My 18-year old cousin enjoyed it, too, and we are both determined never to text and drive or text someone else who is driving! I am now listening to The Memory of Light by Francisco X. Stork, another teen/YA novel about a serious topic. It's about a teen girl who tries to commit suicide and her slow, difficult journey of healing and recovery. I've just started it, but it is already especially poignant to me because a young person close to me has been suicidal. My husband, Ken, finished The Boys in the Boat by Daniel James Brown, a book I enjoyed for book group last year (my review at the link) and heard the author speak for our library's All-County Reads program this spring. He enjoyed it - it was one of his goals this year to read it. I think Ken just started Shift by Hugh Howey, book 2 in the Wool series. He and I both LOVED Wool (review at the link), which several friends had said, "you must read!" They were right! I gave Ken the second book for Father's Day, and I can't wait to read it, too! Jamie, 21, read Flamecaster by Cinda Williams Chima, book 1 in the Shattered Realms series. He loved Chima's Seven Realms series, and this one is set in the same world. Now, he is re-reading Brandon Sanderson's The Way of Kings, book 1 in the Stormlight Archive so that he can next read book 2, Words of Radiance. The first one is 1200 pages long, and the second one is 1300 pages, so he is definitely in the Big Book Summer groove! 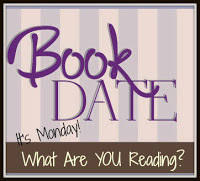 Movie Monday: Room - movie adaptation of one of my favorite books! TV Tuesday: BrainDead - political satire + sci fi = you have to see it for yourself! Hilarious! My Summary of Books Read in June - a good reading month for me! 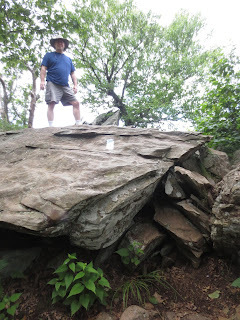 Saturday Snapshot: Shenandoah National Park, Part 2 - rocky trail & great views! There is still plenty of time to join the Big Book Summer Reading Challenge - seven weeks of summer left! 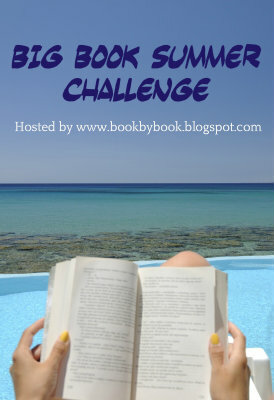 Just click the link to read the rules - super-easy for summer! You only need to read one "big book" (400 pages or more) before September to participate. Join the fun, choose your Big Book(s) & sign up today! 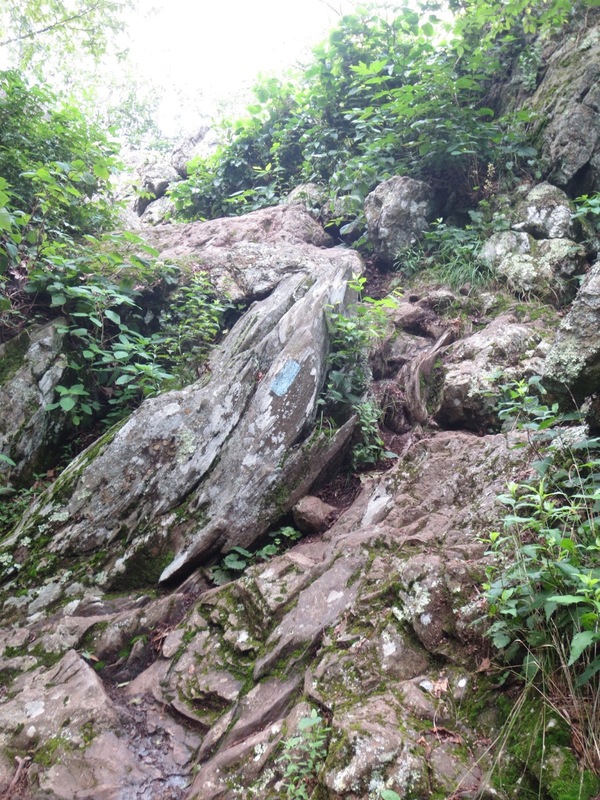 The trail climbs up, up, up right from the start! 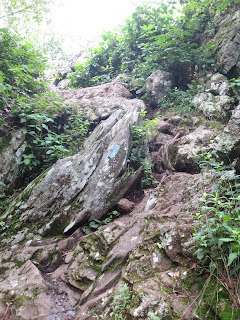 Blue blazes lead you UP the rocks! My husband - you can make it! We are missing that cool mountain air! Hope you are enjoying a lovely weekend and staying cool (supposed to be close to 100 today and tomorrow here). 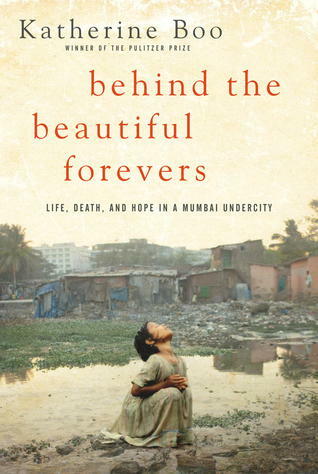 Back in 2012, Pulitzer Prize-winning reporter Katherine Boo published her first book, a nonfiction book called Behind the Beautiful Forevers: Life, Death, and Hope in a Mumbai Undercity, and it won the National Book Award. That same year, my son and his friends started college, and their new school, the University of Delaware, selected Boo’s award-winning book as its All-Freshmen-Reads book. With all of that – plus a lot more accolades and publicity – I wanted to read Boo’s book for myself, but it’s taken me four years to finally get to it. I suggested it for one of my book groups, and we discussed it last night. I don’t know why it took me so long to get to this compelling, fascinating, powerful story of life in an Indian slum. Although it is entirely nonfiction, Boo has written her book like a novel, introducing “characters” (who are real people) and following their lives through some incredible events that rocked their community. That community is Annawadi, a ramshackle shantytown with a sewage lake, built by squatters within sight of Mumbai’s big international airport. This real-life Mumbai slum houses 3,000 men, women, and children in 335 tiny, hand-built huts, people living from hand to mouth, literally, trying each day to earn enough money to feed their families. As the book opens, Abdul, a sixteen-year old boy who earns his living – and supports his 11-person family – by collecting trash and sorting it for recycling, is hiding in the small shed where he runs his trash business. The police are coming for his father and will be looking for him, too, for a crime that neither of them committed. His mother, Zehrunisa, has urged him to hide, while his father, sick with TB, gives himself up to the police. This strategy will allow the family’s main income-earner to remain free for a little while longer. Abdul’s next-younger brother, Mirchi, has bigger dreams than sorting garbage. He still goes to school (their father recently told Abdul, “you didn’t have the mind for school anyway”) and hopes to get a job with a uniform in one of the luxury hotels near Annawadi. There are many other young people living in close proximity in Annawadi’s huts. There is 15-year old Meena, who dreams of freedom; she’s been promised in an arranged marriage she doesn’t want. Little Sunil, just twelve years old, yearns for a “career” like Abdul’s – he wants to earn enough money so that he can finally stop being hungry all the time and start growing. Manju, a young woman, is an unusual citizen of the slum. She is attending college, with aspirations to be the very first female college graduate from Annawadi. When she isn’t studying herself, she leads a rudimentary school in her family’s hut, teaching eager young children – often teaching them the same things she herself is studying. Manju’s mother, Asha, has her own aspirations, to both support her intelligent daughter and to boost their family’s income and position. Asha is interested in politics. Currently, she works unofficially for the Corporator, the elected official whose precinct includes Annawadi. She acts as his go-between on the ground, listening to the complaints of residents and trying to resolve them. She hopes to one day be the unofficial slumlord of Annawadi, and from there, move ahead in politics, thus moving her family into the middle-class on the backs of her neighbors. The One-Leg is another resident of the slum, who rents a tiny room from Abdul’s family with her husband and two small children. Born disabled, her given name is Sita, but no one calls her that. They all call her the One-Leg, and she tries to prove she is worthy and attractive by making herself up and picking up men while she limps around on her crutches. There are no secrets in this community, with tiny huts crammed together, and thin walls between families (the lucky ones have walls; some separate their living spaces with sheets). Boo introduces the reader to each of these people – and more – while also telling their stories: where they came from, their families, how they scrape by and try to support themselves. Meanwhile, the book starts with Abdul’s father’s arrest and then traces that event back to its origins and follows it through to what happens to each of the people involved. This nonfiction book reads so much like a gripping novel that I had to keep reminding myself while reading that these were real stories and real people. The author is completely absent from the book; it’s not about her experiences in Annawadi but about the residents there. In the course of getting to know these individuals and following their lives, Boo naturally introduces (through the stories, not through any explanations of her own) issues of economics, politics, criminal justice (or lack thereof), and corruption. Oh, the corruption! It is absolutely unthinkable how corrupt systems are in India (and especially for these people with little money) – bribes are needed to get adequate medical attention, to get decent treatment from the police (I can’t say “fair treatment” because it’s all about who bribes more), and to participate in the justice system, such as it is. For those fed up with American or European politics who think all politicians are corrupt, wait till you hear what’s going on in India! And that is what is at the heart of this book – Boo puts real people, real faces, real hopes and dreams onto the sometimes abstract concept of poverty. With Annawadi, in particular, the reader clearly sees the absurd juxtaposition of the 5-star hotels and international airport right up against this world of raw sewage, little clean water, and scarce food. She takes the reader deep inside someplace that most of us have never been. My book group had some great in-depth discussions last night about Behind the Beautiful Forevers. There is so much to talk about here, and the stories in the book provide insights into many different aspects of poverty and today’s world. We discussed that the lessons learned from this book are just as applicable here in the U.S. as they are in Mumbai. Everyone agreed the book had been interesting and engaging (ratings ranged from 6 to 10). As a bonus, one of our group is a woman who grew up in India and has actually been to Annawadi, so her observations and insights added more to our discussion. This book is a perfect example of narrative nonfiction at its absolute best. As someone who reads about 90% fiction, I was completely riveted by this book and its stories. In fact, when rating books in my book groups, I rarely give anything a “10,” but that’s what I rated this one. To me, it was like the best of fiction and nonfiction combined: engrossing stories about interesting people, set against a fascinating backdrop that I knew little about. I learned a lot and loved reading this book – I wish that more nonfiction was written this well and this engagingly, and I can’t wait to see what Boo does next. I'm not usually a fan of book trailers, but this one is 100% actual video taken in Annawadi as Katherine Boo spent time there, and the photos & video of this vastly different world are fascinating. See Katherine Boo's website for more photos. Ha! 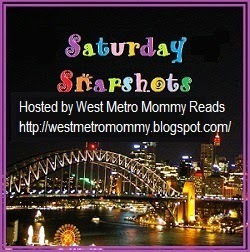 Only July 20 - I'm catching up on reviews & getting better (a bit!) on my monthly summaries. So, six books total in June, all fiction, and almost all of them were YA and middle-grade, which is unusual for me (I normally read a mix). I read my first Big Book of the summer and my first classic of the year (finally!) - see details below. My favorite? Ooh...that's a tough one. These were all good. 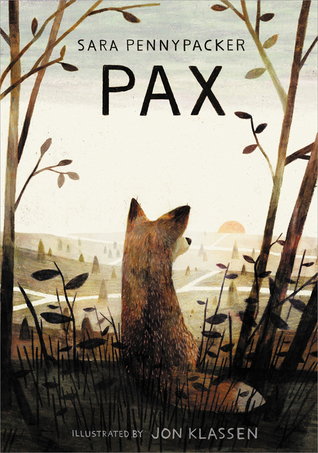 I think I liked Pax the best - it was a really powerful, unique story about hope, love, and war. This is my favorite part of my monthly summary - updating my Reading Challenges! I (finally) read 2 more TBR books in June for my Read Your Own Damn Books Challenge - that's a total of 8 so far this year, which is not very good! 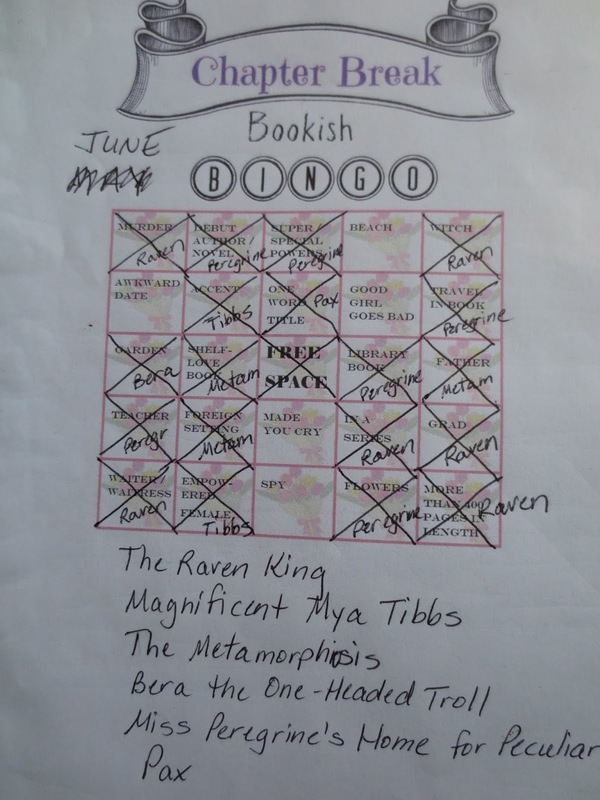 For the Monthly Motif Reading Challenge, June was A Book Recommended by Girlxoxo month - um, yeah. 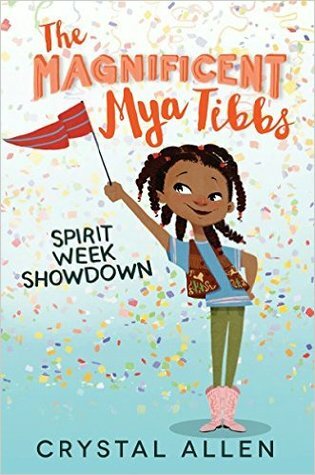 Since I didn't look at the monthly topic until just now, that's not so good...BUT she did recommend The Raven Boys, book 1 in the series I finished last month, so that counts, right? No nonfiction last month for my 2016 Nonfiction Reading Challenge, but (drumroll) I finally read a classic for the 2016 Classics Challenge! Woohoo! For my Travel the World in Books Reading Challenge, I read books set in Hungary and UK (Wales). I am also tracking the states my books are set in, even though there is no Where Are You Reading challenge this year - I added 3 new states this month! 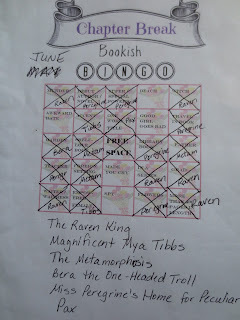 Finally, I did my best ever on the monthly Bookish Bingo hosted by Chapter Break (you can join the fun any month without officially joining a challenge). Here's my Bingo card for June - I filled a record 20 spaces! Without a lot of shows to watch during the summer, my husband and I decided to try something new last week. I'd been seeing ads for BrainDead. Frankly, I thought it looked really weird, but it's from the creators of The Good Wife (one of our recently departed favorites! ), so we thought we'd give it a try. What followed was one of the oddest hours of television we've ever watched! As strange as it is, though, it is also really, really good - we're hooked! OK, so try crossing the political drama and satire of House of Cards with the sci fi plot of Invasion of the Body Snatchers, and add in a hefty dose of humor. Got it? No, probably not. This is one show you definitely have to see to understand. Basically, it posits that the reason politicians seem so crazy these days is that a bunch of them have had aliens eat their brains. It makes as much sense as anything else, doesn't it? Laurel Healy, a young woman who grew up in Washington, DC, reluctantly returns to her hometown to earn some money so that she can return to her real passion: making documentaries about obscure types of music in isolated places. Laurel is not all that happy to be back and really hates politics. The rest of her family, though, are DC-insiders. Her father, Dean, played by Zach Grenier (The Good Wife's David Lee), has worked in politics all his life and agrees to give Laurel the money she needs to finish her current documentary if she will work in her brother's office for 6 months. Her brother, Luke Healy, played by Danny Pino, is a Democratic Senator. Right from Laurel's first day as Constituent Coordinator, it is as she feared: politics as usual, with back-room deals, extremist views, and power-hungry members of Congress (including her brother). To make matters worse, Congress can't agree on a budget and is about to shut-down the government. To try to avoid that and keep thousands of people in DC working, Laurel agrees to meet with Gareth Ritter, played by Adam Tveit from Graceland, a staffer for Republican Senator Red Wheatus (played hilariously by Tony Shalhoub), who is on the opposite side of the budget crisis. Meanwhile, something very strange is going on in DC. Some aliens that look like ants have escaped from a meteor that was delivered to the Smithsonian. They crawl into people's heads through their ears and either eat up (and spit out) a good portion of their brains or their brains explode. Really. And to top it all off, Laurel keeps hearing "You Might Think" by The Cars playing. Yes, it's just as weird as it sounds! But somehow, despite the complete goofiness of the concept, it works. The acting is excellent: Mary Elizabeth Winstead does a great job as smart, good-hearted Laurel, and the rest of the cast is great, too. The writing is top-notch; you can tell it shares a pedigree with The Good Wife. It manages to be a political satire, a sci fi mystery, and a comedy all at once. Oh, and there is even some romance in it, as Laurel and Gareth are clearly attracted to each other but on opposite sides of the aisle. We have now watched three episodes, and it just gets better and better. You have to at least try 2 episodes, minimum, so you can hear the hilarious little "previously on" song they sing at the beginning of the show! I know it sounds incredibly strange, but you have to trust me on this one. Give it a try - it is oddly compelling and very funny. 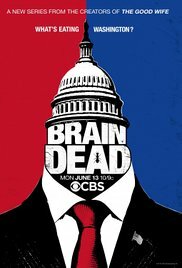 BrainDead is currently airing on CBS Mondays at 10 pm and all three of the current episodes are available On Demand (I think episode #1 comes off Demand on 7/24, so hurry up!). All episodes are also available for free on Amazon Prime or for $1.99 an episode for non-Prime members (link below). They are also available on CBS All Access, if you are a member (since when do the networks require membership to watch their shows?). 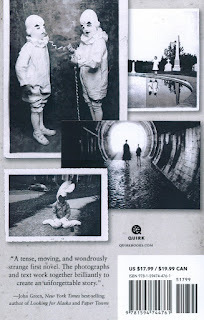 I absolutely loved the novel Room by Emma Donoghue when I read it in 2011 (my review at the link). It lived up to all its hype - and more - and kept me captivated. My husband read it and loved it, too. When the movie came out last year, I was dying to see it and hoped to go with some book group friends, but I didn't get a chance while it was in the theater. I finally had my chance last week when my husband and I found it free on Amazon Prime. It was wonderful and loved up to the promise of the book. The movie follows the book's story quite closely (Emma Donoghue also wrote the screenplay). A young woman, played fabulously by Brie Larson, has been held captive in an 11-foot by 11-foot room for 7 years. During that time, she gave birth to a boy named Jack, played remarkably by young Jacob Tremblay. Ma, as Jack calls her, has done a great job of bringing Jack up under these horrific conditions. Jack was born in the room and has never left it, so he doesn't realize there is anything else. He's happy and healthy, full of fun and very smart. Ma has kept up a nice routine for the two of them, with time for learning, exercise, and play. As the movie opens, it is Jack's 5th birthday. He is full of questions, bright and curious, and he and Ma enjoy a small celebration. Their captor, known only as Old Nick, comes to visit during the night. Ma has put Jack to bed inside a large wardrobe, as usual, so that he won't know what's going on. Jack is getting older, though. He asks more questions, watches through a crack in the wardrobe, and one night, Old Nick sees him (Ma is usually careful to keep him out of sight). Ma begins to realize that Jack is growing up, and this room is no longer enough. Thus begins a dangerous period of trying to plan an escape from a place she previously thought was inescapable. Just like the book, the movie is tense and filled with suspense, but it is also warm and tender. Because the story is shown from Jack's perspective, his innocence pervades the tone, keeping it from being too dark or disturbing (though, of course, the situation is still disturbing). It's a completely unique story, filled with hope and love, about healing and moving forward. We both loved it and thought it was an excellent adaptation of the book. NOTE: If you have not yet read the book and want to, then skip the movie trailer for now - it gives away pretty much the whole story. I've been careful to avoid spoilers in my review here and in my book review. 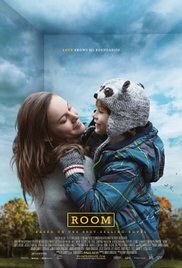 Room is currently available for free on Amazon Prime (or available to rent for $4.99 if you don't have a Prime membership) or on DVD. Back to semi-normal around here last week. 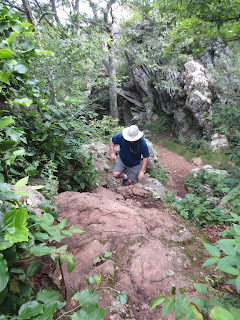 We came back from our mini vacation at Shenandoah National Park (first round of photos here), our sons came back from sailing with their grandparents, and our older son moved back to campus to start summer session. It's been busy around here, but we are enjoying summer, too. 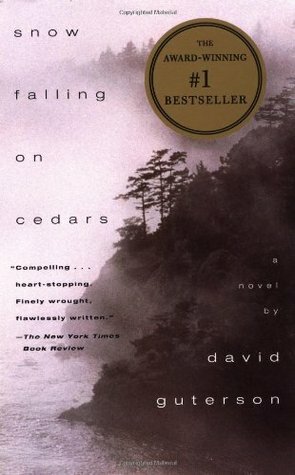 I am still reading a book group selection, Snow Falling On Cedars by David Guterson. I have never read this award-winning novel before (though I saw the movie adaptation years ago), even though it's been on my Kindle for years. It's a very descriptive novel about a Japanese-American man accused of murder in the years after the Japanese Internment and the events leading up to that time. It takes place on an island off the coast of Washington, and the setting is vividly described, almost like another character in the story. I'm enjoying it so far, but it is a dense book, so it's slower going than I expected. I am still listening to The Secret Language of Sisters by Luanne Rice, a teen/YA novel about one of two sisters who is paralyzed in a car crash and has locked-in syndrome. I'm almost finished, and it's been very good. I texted with my 18-year old cousin yesterday about it - I gave her a copy of the same book (I had both book and audio) when she visited last month. She enjoyed it, too, and we are both determined never to text and drive or text someone else who is driving! My husband, Ken, is still reading The Boys in the Boat by Daniel James Brown, a book I enjoyed for book group last year (my review at the link) and heard the author speak for our local library's All-County Reads program this spring. He's been wanting to read it for a while and seems to be enjoying it. I don't know what Jamie, 21, is reading right now, though I'm sure he read on the sailboat (not so much time for reading now that he's back in school). I was just going to text him and ask, but he's in class right now - is that a good enough reason to interrupt his class, to ask what he's reading?? 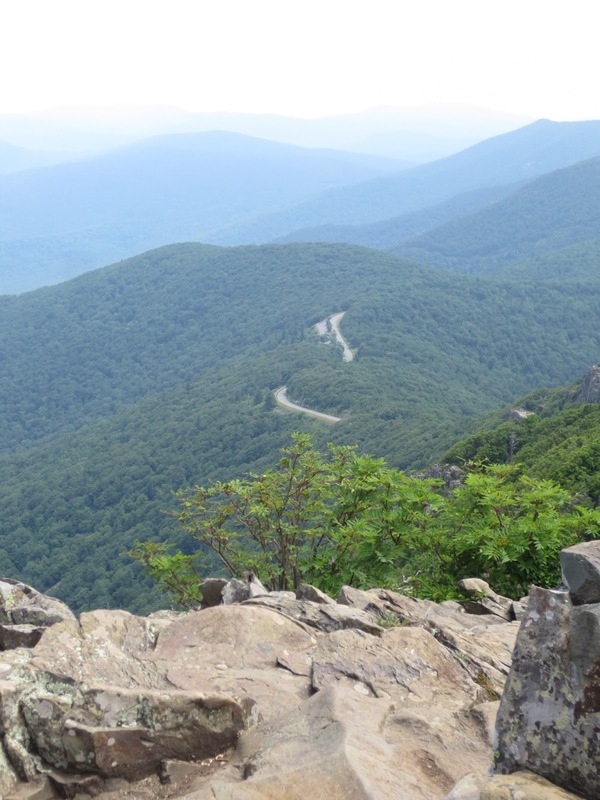 Saturday Snapshot: Shenandoah National Park, Part 1 - pics from our recent trip - camping & hiking Stony Man Trail - more next week from this amazing park! There is still plenty of time to join the Big Book Summer Reading Challenge - eight weeks of summer left! Just click the link to read the rules - super-easy for summer! You only need to read one "big book" (400 pages or more) before September to participate. Join the fun, choose your Big Book(s) & sign up today! I recently listened to the middle-grade novel Pax by Sara Pennypacker. I’ve never read any of her books before but really loved Pax. This exciting, warm, intricate novel about the bond between a boy and his pet fox kept me riveted right from the first chapter. Peter found a newborn fox kit when he was just weeks old, with his family killed. The other kits in the nest had already died, but one was still alive, though weak, when Peter took him home and nursed him back to health. He named the fox Pax, and the boy and the fox were inseparable. Having grown up in captivity, Pax knows nothing of life in the wild, and he loves Peter – and feels protective of him – just as much as Peter feels for Pax. As the story opens, however, Peter and Pax are being torn away from each other. There is a war going on, and Peter’s father has enlisted. While he’s away, Peter will go to live with his grandfather, so Peter’s dad says they have to take Pax back to the wild. He drives to nearby woods and makes Peter toss a toy as far as he can for Pax to chase. When Pax comes back with the plastic soldier in his teeth, Peter and his father are speeding down the road in the car. Both Peter and Pax are heartbroken, and Pax is also very confused by this unexpected turn of events. Peter knows immediately that it was the wrong thing to do. He sneaks out of his grandfather’s house his very first night there to go back for Pax, but the spot where they left him is 300 miles away, near Peter’s home. The distance doesn’t matter to Peter; he is determined to find his fox. Meanwhile, alone in the fields and forest, Pax feels scared and confused. He’s never lived in the wild and doesn’t even know how to find food (his favorite is peanut butter), and the other animals he encounters are not always friendly. But Pax is just as determined as Peter to be reunited with his boy, and he hangs onto the plastic toy soldier with Peter’s scent on it and decides to wait for Peter to come back. Chapters alternate between Peter’s and Pax’s points of view. That might sound odd, hearing a story from the perspective of a fox, but Pennypacker makes it work beautifully. Both characters have warm, endearing voices that make you care about them. Peter encounters significant hardships on his long journey, though he meets a hermit who lives alone in the woods who helps him, both physically and emotionally. Pax meets serious challenges of his own, in his struggle to survive in the wild, but he also makes new friends among some other orphaned foxes who help him. The war is also a significant theme in the novel, occurring right near where Pax was left and where Peter is headed. The animals’ reactions to this human concept of war are particularly intriguing, as the other foxes try to explain to Pax what is happening. The time and place of the story are left intentionally vague; its lessons about friendship and war apply to the past as well as the present and the future. This unique novel was absolutely compelling – I finished listening to it in record time, scarcely removing my earbuds! It is a story of friendship – between Peter and Pax but also between humans – and of survival. This is a tale of adventure and suspense, but it is also warm and heart-breaking at times. Pax’s role in the story and his relationship with Peter reminded me somewhat of Kate DiCamillo’s novels, like Flora & Ulysses and The Miraculous Journey of Edward Tulane, which is a big compliment! I loved every minute of this tense yet hopeful story about friendship, love, war, and peace. P.S. The audio book was excellent - you can listen to an audio sample at the Amazon link below. Just click the "listen" button. Mountaintop Selfie with Amazing Views! View to the north - see Skyline Drive? Relaxing by the fire with a great book! More photos from the trip next week! 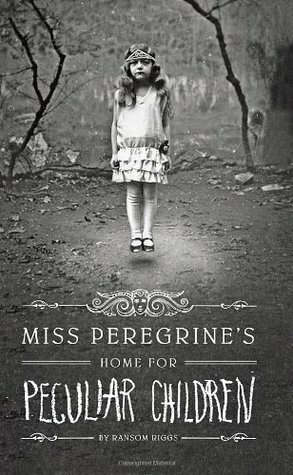 I’ve wanted to read Miss Peregrine’s Home for Peculiar Children by Ransom Riggs ever since its release in 2011. Now, there are two sequels to complete the trilogy and a movie coming out on September 30! So, I’m glad I finally had a chance to read this popular and well-received book. It is, without a doubt, the most unusual – peculiar? – book I’ve ever read! But this teen/YA supernatural fantasy is also suspenseful and compelling. Sixteen-year old Jacob grew up listening to his grandfather’s fantastical stories of growing up among monsters. According to Grandpa Portman, he’d had to leave Poland at age twelve to go live in an orphanage in Wales, with enchantments to keep its young residents safe from monsters. Oddly, Grandpa claimed that the other children in the home had all kinds of special powers, making them what he called “peculiar.” Grandpa even had a box of old snapshots that he shared with Jacob of his old friends: an invisible boy (which looked like an empty suit of clothes in the photo), a girl levitating off the ground, and a brother and sister so strong they could lift boulders in the air with ease. There were plenty more crazy photos, with an even crazier story accompanying each one. Jacob fully believed everything his grandfather told him when he was young, but when classmates began teasing him about believing in fairy tales at school, he gave up his childish beliefs. He asked his dad about Grandpa’s stories, and he explained that they were just exaggerations, built on a horrible childhood. 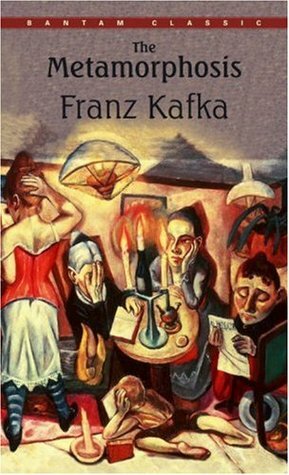 There had been real monsters then – the Nazis – and his dad explained that the children’s home in Wales probably seemed like a paradise and safe haven compared to Poland at the time. He further guessed that the childrens’ only real peculiarity was their Jewishness back then. When a family tragedy occurs, Jacob and his father head to Wales to find out more about Grandpa’s childhood. Although his dad is more interested in the unusual birds inhabiting the small island off the coast (he’s an ornithologist), Jacob explores on his own. He finds the old house on the deserted side of the island, crumbling and decrepit, and digs through it for clues to his grandfather’s time here. He finds more odd photos and even his grandpa’s old room. Oddest of all, though, is the possibility that some of the same children might still be here, in hiding. I won’t divulge any more of the plot (and was careful to stay away from spoilers even in this brief synopsis) because one of the delights of this unique book is in uncovering its secrets one by one. Jacob’s explorations become more and more dangerous, as he digs into the secrets of the past…and the present. The climax of the story coincides with an enormous storm hitting the island, adding to the suspense. I haven’t yet mentioned the most amazing and unique thing about this book. The photos – that Jacob’s Grandfather shows him and that Jacob later finds in the house – are real. Real-life real. The author found them by scouring through thousands and thousands of vintage photographs and includes several dozen of them in the book, to illustrate the story. He basically discovered these unusual photos and then built the story around them, a fact that made the book all the more fascinating to me. Reading this supernatural fantasy tale is a singular experience, and I found myself studying each photo as it appeared. I was also completely engrossed in the original story and was rooting for Jacob to find some answers for himself. The novel is full of adventure and suspense, supernatural surprises, and a bit of magic, but it is all wrapped up in a gripping story of a modern teen, trying to come to terms with his family history and his own place in the world. I loved every minute and can’t wait to read books two and three…and see the movie, of course! I was going to include the movie trailer here in my blog post, but I think it gives away far too much of the plot, if you haven’t read the book yet. So, go enjoy the book first (before September 30)! If you have already read the book, check out the movie trailer at this link. It looks like they’ve taken a few liberties with the story, but Tim Burton is the director, so he adds his own brand of magic.